The plumbing system in a home is one of the most integral parts of the structure and one of the critical systems that contributes to the comfort and safety of all who dwell in the home. As homeowners, we all depend on our plumbing to function correctly, and when it doesn’t we want a trained professional to make it all right again. Whether you have a sink drain that is draining too slowly or a main sewer line blockage, Allright Plumbing and Heating is the local plumber in Colorado Springs to call for all your HVAC, plumbing, and drain cleaning service needs. We provide installation, maintenance, replacement, repair, and more services to both residential and commercial customers in the Colorado Springs, Monument, Black Forest, and other surrounding areas of El Paso County for all their plumbing, heating, and HVAC needs. We’ve been in business for decades and are proud of our A+ rating with the Better Business Bureau. Homeowners across the area know that we are the local plumbers in Colorado Springs to call for professional drain cleaning service, HVAC (including all types of air conditioners, heaters, or furnaces), and other jobs when you need things done right. You can trust our experienced team to assess the problem, ask the right questions, and apply the correct solution to get the job done right every time. Repair or replace your AC, furnace or boiler, heaters, and more! At Allright Plumbing and Heating we use only the best, up-to-date equipment to make sure that all your drain lines are doing their jobs correctly and everything is running smoothly. Our local plumbers in Colorado Springs are thoroughly trained in the latest equipment and industry best practices, so you can be assured you are getting the best possible service from a trained professional. We understand how important it is to have everything in your home working correctly for the safety and comfort of you, your loved ones, and your guests. 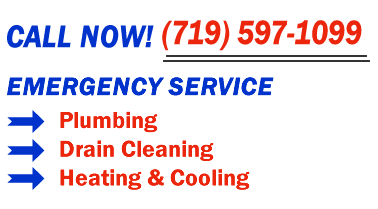 For the best in drain cleaning and other plumbing and heating services, call Allright Plumbing at (719) 597-1099 today! In addition to providing you with the best in drain cleaning service, we can help when your furnace or air conditioning systems aren’t functioning properly. We know that these systems are not just about comfort and that keeping your home at the proper temperature helps prevent damage to your personal property by protecting it from extreme temperatures, and safeguards the health of small children, elderly, pets, and those who have special physical needs. When you need a professional to help clear your clogged drains, fix your furnace, or help your home HVAC system work correctly, call on the friendly folks at Allright Plumbing and Heating to make everything as it should be once again. For everything plumbing and heating related from drain cleaning service to furnace installation, call our experienced local Colorado Springs plumbers today for a free phone estimate and to schedule an appointment at (719) 597-1099, or fill out our user-friendly online appointment request form. We offer professional emergency furnace repair services so that you and your loved ones are never left out in the cold on a subzero winter night. When the temperature rises on those hot summer days and your air conditioner isn’t doing its job either, we can help you beat the heat and keep your home cool and comfortable all day long with the best air conditioning repair in Colorado Springs. No matter what is giving you trouble, give us a call and our knowledgeable staff will be happy to give you a free, affordable estimate over the phone based on your detailed description of the problem. Don’t stress over your plumbing, heating, or cooling problem, give us a call today and let us make everything all right again.